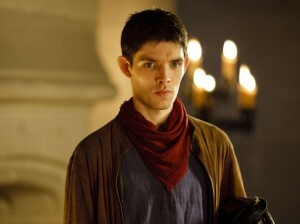 The fourth series of Merlin comes to the United Kingdom later this year and hits the Syfy channel in the U.S. in early 2012. 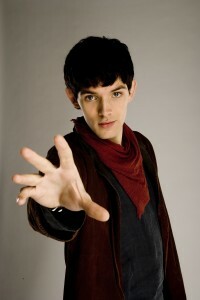 Leading the cast as the title character is the extremely friendly Colin Morgan. We participated in a roundtable discussion with Mr. Morgan prior to the Merlin panel at last weekend’s Comic-Con International in San Diego. Colin spoke a bit about what’s to come for the series, and revealed a treasure trove of Series 4 spoilers. Enjoy! How are things going as Merlin enters its fourth series? As you can tell by the posters, it’s gone in a different direction. The style of it’s changed and the look of it’s feeling quite different. It will still have that charm and the creativity and the surprises that it’s always had. In fact, it feels that this series, to me, is the most surprising. It’s the most surprised I’ve been, reading the scripts. “Are we really going in this direction? Are we actually doing this?” And it’s got more of a serial feel to it, so episodes aren’t as stand-alone. There’s no going back. Each episode takes a progression as a piece of a jigsaw that has to be completed. There’s no reverse going on. We’ve got a new villain coming in right from the beginning, a guy called Agravaine who’s Arthur’s uncle, and Uther is a state that the producers have said is very much like “the Madness of King George” type feel, when someone is no longer capable of doing the job that they’re supposed to do, that everyone relies on. What happens? That’s explored. Merlin gets the biggest chance that he’s ever going to get to set the future in the direction that he wants, the destiny that he is set to achieve. He wants to see magic return to the kingdom. He wants to live in a world where he is free and magic is free under the rule of the greatest King the land has ever seen. And he gets the biggest opportunity he’s going to get to do that. So the tagline of “Keep the magic a secret” – I don’t know how long that’ll last now. We’ll see. What is he discovering about himself and what is he discovering about his magic? He’s discovering more and more how lost he is, which is kind of anti-discovery in a way, because the more you’ve found out, the more you lose. He’s finding out that as everyone else is slotting into place, he’s suddenly in the middle, going “Where do I fit in?” And he’s never fitted in, but this is when he feels it the most. And when family ties and loyalty and royalty overrule friendship, that’s a big blow to him. Throughout the series, Merlin’s very much left in a limbo. So there are big changes in Merlin and Arthur’s relationship? I think so, yeah. There’s a serious tone now going on, and you often have some situations where Merlin’s trying to get that friendship going on and is met with a wall, and he’s not sure how to deal with that, so there’s a lot going on there. When it’s time to put the childhood things away, how do you move on, maybe when you’re not ready to do that? That’s the big theme that’s explored in this series. So Season 4 is more moving into the adult age? The relationship started to get more playful again toward the end of Season 3. There will always be the charm of the show. That’s something the producers and the writers are big on. In fact, in times of desperate need and seriousness, you need to laugh. You need to not take it seriously. It’s what people do. And you know, I think when times are tough, you resort back instinctually towards things like that, and yeah. You still have the banter that Merlin and Arthur will always have. It’s just not always appropriate. Is the show going to continue to be a family show? It’s definitely going deeper and darker. I think kids will be more scared by the series. I think there are elements in it, particularly with the first two episodes, it plays on that childhood fear of the dark, and what’s in the dark, and when you’re lost in the dark, literally, darkness, what’s there? And what’s there is pretty terrifying. These things that have been unleashed from a split in the veil between the real world and the underworld have come out, and they only come out at night, while we’re asleep. So there’s a feel there that that’s a scary thing for kids. I think the emotional element of it, I think anyone can relate to, just in different ways, and a serious as it is and as deep as it is, it’s very much grounded in reality, and I don’t think that can ever not be suitable for people watching it. Is Merlin going to stay close to the legend or depart a little? Will we see more of the sword? A big theme to the show is to present the legend but in a different, unexpected way. So you’re seeing things coming about and consequences coming about, linked to the legend but in a creative version. But we are seeing the return of a lot of the elements that have come up in the past. Particularly the Knights of the Round Table in this series. There’s a real feel that this band of guys are coming together, and there’s very much a feel that that’s a formation that’s happening. Lancelot is back, and of course there’s a really good twist for anyone who’s up on the Arthurian legend, and knows of the Arthur/Gwen/Lancelot love triangle. There’s a brilliant storyline coming up which is a really good twist on that, which I think is the most obvious Arthurian reference we’ve had so far. Is there going to be more conflict with Uther? That’s the big thing. Uther’s the big obstacle for Merlin. If there’s any sign that Arthur is thinking like Uther’s thinking, then he can never bring his magic to the fore. He can never get that kingdom he wants to have. Because there’s no breaking that mindset that Uther has. So the big upset and the big fear that Merlin has is a reincarnation of Uther in Arthur, and that’s a major fear. So yeah. Uther is the big obstacle for Merlin, and there’s a big focus on him because he’s losing his mind this season. He’s a ghost of himself, in a way, but still firmly grasped on those rules that are still in there from years and years and years of hatred. So yeah. It’s a big obstacle to overcome from Merlin. It’s very interesting. How do you win against someone so powerful and so grounded in what they believe in, and in something that’s so much a part of who you are? You can’t overcome it, because you can’t reveal it, and you can’t compete with a King. As much as he’s wrong and as much as you believe everything he believes is so much against peace and love and what the land should be, you can’t compete with someone like that. And then the state of mind that he’s in as well, he’s pretty delusional, you’ll see right from the beginning. He’s lost it. Are there going to be more big clashes between Merlin and Morgana? Yes. Yeah. More than ever, though there’s a real focus on the Knights of the Round Table and a royal feel to the series, the fantasy element is probably bigger than it’s ever been in this season coming up. The battles that we have are more epic. Morgana has a paranoia of Emrys. She doesn’t know who this is. She keeps having visions of an old man called Emrys. She doesn’t know it’s me in the future. And you get glimpses of the future, the genuine future, of what’s to come, as well. Right from the beginning. Are we going to have more of the Dragon this season? Yeah. The Great Dragon, voiced by the great John Hurt, is back again. In fact, there’s an episode that focuses solely on dragons and the future of the dragons, which is one of my favorites, because it feels like it’s lifted right from Indiana Jones, which I love. So yeah. The Dragon is really explored this series – something I was really excited about. Will we see anything of the relationship or the friendship between Merlin and Gwen? As I said, Merlin’s really lost this season. With Gwen, they’re really good mates. In fact, there’s one episode coming up where he really needs her help, where they go off on a mission together. They’re really good friends, there’s no doubt about that, but bigger things are happening. Sometimes you’re really good friends with someone, but when they’ve got so much going on, and there are bigger things going on, and realistically, her and Arthur are in love. They’re destined to be together. Merlin would be a very selfish individual to ever go [for her]. How does Merlin connect to that conflict? When the conflict that goes on, you’ll see, because it’s got such a dark, fantasy twist to it, that it links Merlin to it. He’s not outside of it. He’s very much a part of what’s going on. Will Merlin have any wardrobe change this season? I can reveal that – No. [laughs] There is no change at all. None. Actually, you will get to see Merlin as a Knight of Camelot, briefly.